On Thursday April 12th 2018, at the age of 88, Don passed away peacefully at the Boundary Trails Health Centre. Don was born on April 8th 1930 to Hugh John Somers & Agnes (McQueen) of Carman. He is survived by his wife of 59 years, Rose (nee Karalash). Daughters Cheryl Good (David), Gladys Dunn (Murray) and son Warren (Charlene) 7 grandchildren & 15 great grandchildren. He is also survived by his sister Bernice Fry, sister in law Ethel Somers (Clearwater) and brother in law Eddie Karalash as well as many other family members and dear friends. He is predeceased by his brothers Allan, Bert & William and his sisters Doris (Cummer) & Mable (Ginter) as well as infant sisters Florence & Elizabeth Somers. Don spent many years farming and working for the Midland School Division, driving bus and working in the bus garage. 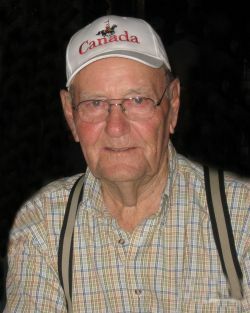 He loved to spend time in his garden, on his tractors, square dancing and old time dancing. His favorite past time was spending time with his family. He will be missed dearly. A private family interment was held at the Greenwood Cemetery in Carman and public service held at the United Church on Monday April 16th 2018 at 2:00 p.m. The family wishes to express their thanks to the doctors and nurses at Carman Memorial hospital as well as Boundary Trails hospital and to the staff at Doyle’s Funeral Home. In lieu of flowers, donations can be made to the Alzheimers Society of MB.10-120 Donald St., Wpg, MB, R3C 4G2. I have many fond memories of the times we spent out at Don and Rose's farm. We always felt welcomed and in the summer always went home wth some of their fresh produce from the garden. Our boys loved going out to Carman and spending time with Uncle Don and Aunt Rose. Condolences to all of his family. I started kindergarten the year Mr. Somers started driving, and his last year was when I graduated from High School. What a thoroughly kind and generous man! Many many fond memories as he was an integral part of my childhood. I remember him pulling into our yard to pick me up at the end of the sidewalk on many occasions when I was either late getting up or the road was too mucky due to rain. My condolences to all his family. Deepest sympathy to Rose and her family on the loss of their beloved husband, father, grandfather, and great-grandfath er. Our sincere sympathies on your loss. Spent many enjoyable hours working with Don at the bus garage. Our sincere condolences! We enjoyed visiting Don and Rose at their farm last summer! Always a friendly guy around the schools and whenever we ran into him! My sincere condolences in the passing of Don. He is one of my earliest "neighbour" memories. I remember when he met Rosie and I was so thrilled when they got married and Rosie moved into our neighbourhood. A quiet gentle man, always a smile, always the same. He will be certainly missed by all who knew him. My sincere condolences in the passing of Don. He is one of my earliest "neighbourhood" memories. I was thrilled when he met Rosie and she became our newest neighbour. I will always remember his quiet gentle demeanour and his ready smile. He will be missed by all who knew him. will miss his smile coming and going when he was in to see Brad, also all the produce Brad would sometimes share when he had too much!